You can switch these views by clicking the segue button on the very right on the toolbar. Playback View is just for playing back a game record. You can see this view when the App is launched or you paste a game record text to the App. Examine View is for examining the position of the game moving pieces by yourself. 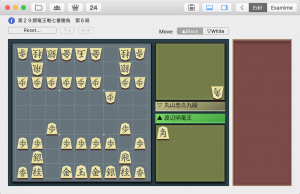 You can examine some various set of moves as branches writing notes. When you moved to this view from the Playback View, the position of the game on the Playback View is copied and it appears on the Examine View. You can save your examined moves and notes. 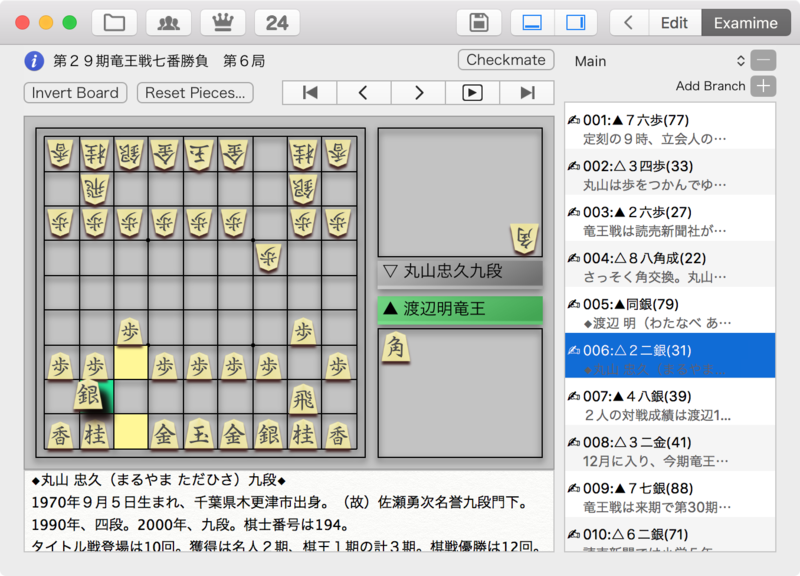 By clicking the Checkmate button, you can check if there are some checkmate moves on the position. Free Edit View is for freely replacing pieces regardless of the Shogi rules. You can use this view when you want to reset the location of some pieces at once. 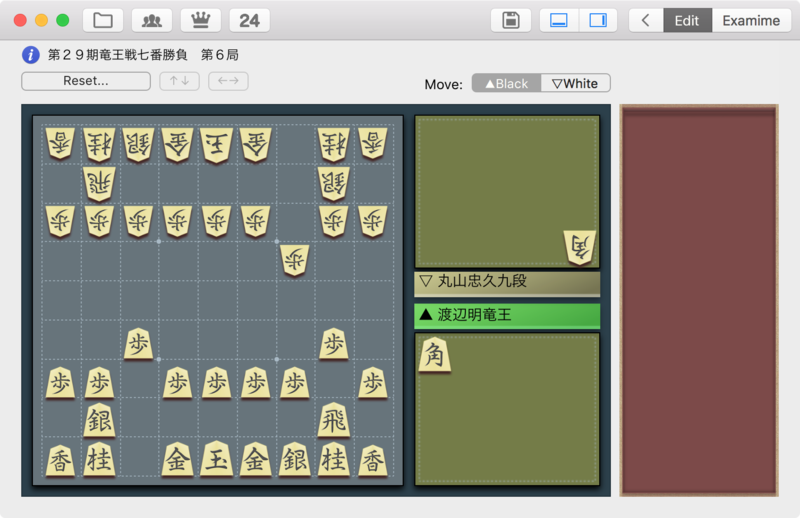 Additionally, you can use this for making Shogi Problems. 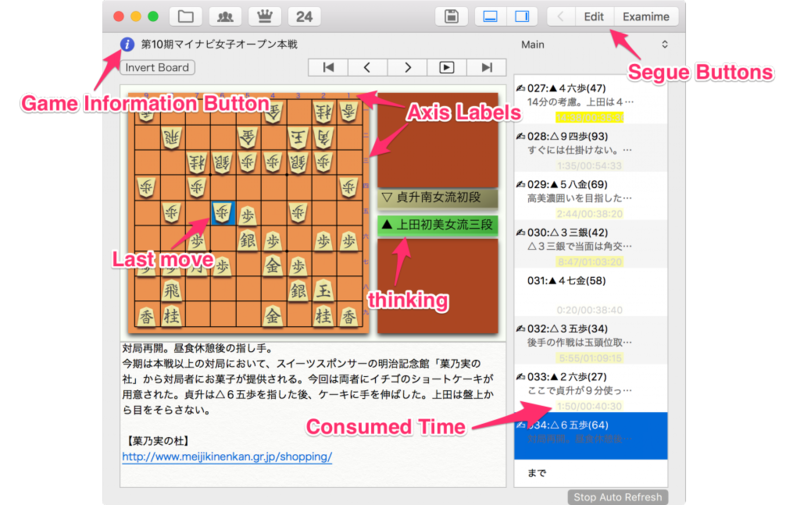 When you want to make the answer of the Shogi Problems, move on to the Examine View and register the answer moves and save it. 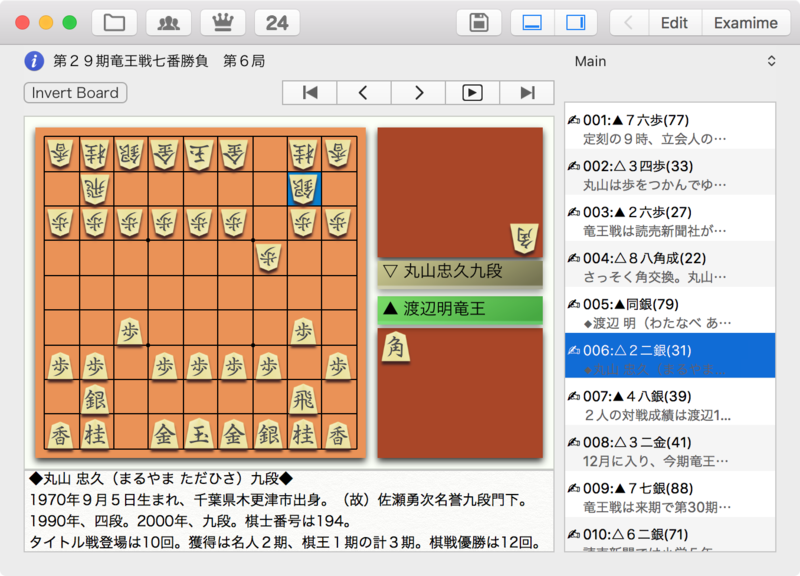 If you save the position of a Shogi Problem on the Free Edit View with the Handicap option as “Composed Shogi Problem”, you can use filter option on the Saved Game List to distinguish Shogi Problems. 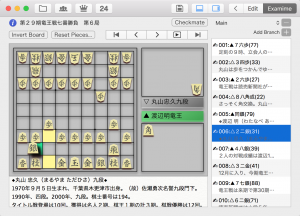 Highlighted piece is the last moved piece. In case of the game record has consumed time for the each moves, it appears on the move list (if you turned on this option in the preferences). In case of it has only accumulated consumed time with the number of the move, it appears below the move of the move list. The highlight of the consumed time means the rate of the total consumed time. The higher rate, the deeper color. By pressing the information button, you can see the information of the game. By pressing the Invert Board button, you can see the board upside down. By clicking the top of the board or the most right of the board, you can toggle displaying the board coordinate axis labels. While you playback the playing game record via the internet, for example, a public major title which is being played (not resigned yet), the game record is refreshed automatically at the interval you set in the preferences panel. If you would want to stop it, press the stop button appeared at the bottom of the window. When you playback a Shared Game record, the comment button and the good! button appear at the bottom of the window. If you send a comment, it appears on the Shared Games list. The good! evaluation is also. When you drop the file you want to playback onto the board, it gets ready to playback. Pick up the piece you want to move by clicking, then click the cell on the board or the piece stand. Change to the position of the game, then press the Add Branch button. The branch button appears at the right side of the move on the move list. By pressing it, the move list will shift the branch move. If there are some branches on a move, the popup menu will appear by pressing the branch button. You can choose the branch you want to shift on the menu. To go back to the previous branch, press the back branch button or select the branch you want to go back from the pull-down menu of the top of the move list. By pressing the remove branch button, the current displaying branch will be removed. Note: All of the information on the Examine View is just a temporary data. If you want to save notes or moves, you should save the game record by pressing the save button. There are three ways to turn over a piece. Button: Click a piece, then press the turn over button. Mouse: drag a piece up or down. Swipe: swipe on a piece up or down by two fingers. There are three ways to rotate a piece. Button: Click a piece, then press the rotate button. Mouse: drag a piece left or right. Swipe: swipe on a piece left or right by two fingers. By pressing the save button, you can save the game. You can see the saved game on the Saved Game List. If you choose “pause”, the position will appear when you playback from the Saved Game List. It becomes the target of searches. 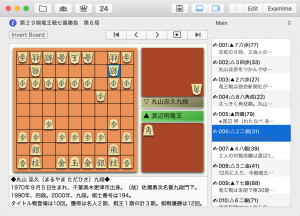 By pressing the filter button and designate filters, it constrains the list of the games. By double clicking the game or pressing the playback button, you can playback the game record. Shared Games is for sharing game records with other users. You can register the game record as a shared game by pressing the share button on the Saved Game List. You can search game records by the same way as on the Saved Game List. You can playback game records published on the internet. Note: You can only playback the game records exist on the site. Therefore you can NOT playback the games where they are removed from the site or the format of the site are changed. You can export saved games. The formats are the below.